and JOSIE UNDER FIRE 1942 by Ann Turnbull. 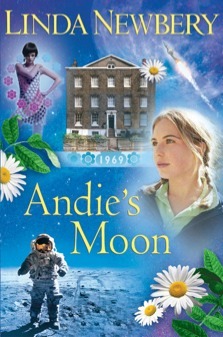 and Linda's book was ANDIE'S MOON 1969. The whole thing began with a conversation between Linda Newbery and Megan Larkin. Linda suggested that Megan might commission a series not unlike the A & C Black FLASHBACKS, but with girls as the main characters. FLASHBACKS did have a more boyish focus at that time. It was, Linda tells me, Megan's idea to link the stories through the idea of a house in London with a girl living in it at different periods of history. 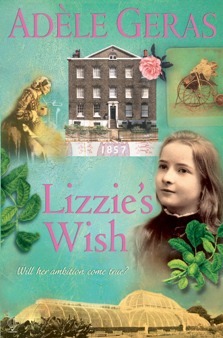 I chose to write about the Victorian period and in particular I was interested in writing (even if only tangentially) about Florence Nightingale and the War in the Crimea. At that time, Linda had planted a walnut in a pot to give as a present to David Fickling. She told me about that, and I immediately saw that if I planted a tree in the first book (as it was at that time) then it could grow and flourish through the whole series. 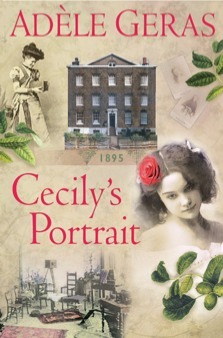 My second book, CECILY'S PORTRAIT is a direct sequel to LIZZIE'S WISH and Lizzie herself celebrates her fiftieth birthday in 1895 under the tree she planted in 1857. Linda and Ann did most of the research work. They walked with Megan Larkin round Chelsea to find the right house. Ann's husband, Tim, made us some lovely floor plans and I was stupid enough to have thought that the back of the house was the front, until my mistake was pointed out to me. I just took advantage of all their hard work. At the beginning, before we'd written a word, we sent one another (and Megan) our synopses. Once we'd agreed that these were okay, we began to write. We swapped information. We showed one another our completed manuscripts. I added a chaise longue to my text which Ann and Linda had previously decided to have in theirs. Ann hid something in her 1764 book for Cecily to find in 1895...and so on. It was an entirely harmonious and pleasant experience, cooperative rather than collaborative. Usborne couldn't have been more supportive. Megan was a perfect editor: helpful and intelligent. When the books came out, we were given a really spectacular launch, with Nicholas Tucker, in front of quite a large audience, talking to us about the series. This Historical House press conference, so to speak, was followed a really wonderful dinner. I'll never forget Nicholas's first question, because it really took us aback a little. He asked us why the main protagonist in each story was a girl. There wasn't a good answer to give except to say: that's what we decided to do, that was the brief and in any case, why shouldn't all the main protagonists be girls? Having a girl at the centre of each book throws, besides, a totally different light on historical events and one which isn't often explored. The fact that boys were not overlooked in the books also, I think, counted for something. Usborne arranged many events for us. We spoke to schools and book groups, such as the Federation of Children's Book Groups. In those long-distant days, there wasn't any Twittering and blogging. Yes, O Best Beloved, back then publishers did a great deal of the hard work of promotion and made sure that the book was reviewed, talked about and known in the wider world. The books were a success, I think. In any case, we were each asked to write another. 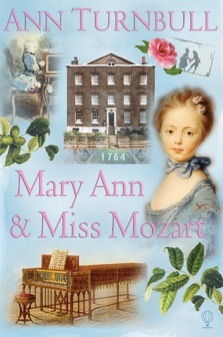 Ann chose to go back before the first book, to 1764 in her story, which involved Mozart's sister, who came to perform in this country as a girl. Linda's book is about the Moon Landings, which counts as History, even though I remember it very well. I feel quite unashamed in doing my bit, a few years down the line, to spread the word once more. Children grow up and other children take their place. It would be good if the new generation could enjoy these books now. Though I say it myself as shouldn't, I think this is an excellent series and it deserves to be read again and written about again. For my part, I loved writing my contributions to the set and I wouldn't mind doing the same sort of thing a second time. Thanks, Megan, and thanks to Linda and Ann too. What a wonderful experience this collaboration must have been! What fun to weave things in and out of each other's stories! - And how sad that a series like this probably wouldn't even be commissioned now, still less supported. Thanks, Adele - I enjoyed reading this. I very much enjoyed reading this too - thank you, Adele - and I have spotted these books in so many school libraries; in that context they are clearly being read again and again. What a fantastic experience to've worked so collaboratively - what a great team you clearly all made! They ARE wonderful books! I have all six and would highly recommend them. 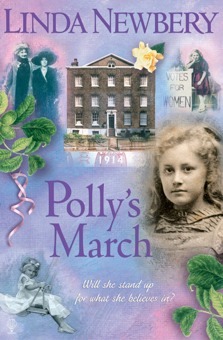 Ideal for Christmas presents for anyone who has girls aged 7 or 8 to 12 to choose for! Fascinating and what a lovely idea for writers to collaborate in such a way. One question: did the present occupants of the house know about your endeavours? Mark, when we chose the house and went to look at it, it was unoccupied and having work done on it - and in any case we disguised the exact location in the books. I don't know whether the present owners know about the books. This post brings back happy memories, Adele! What lovely covers too - the series are tied together so well. These books have a special place for me, because the house you chose turns out to have been the very one (6 Cheyne Walk, somewhat disguised in the books I recall) where my own family lived from 1780-ish to the 1850s. Here is a picture of my great-great aunt Fanny, taken at about the time of Lizzie's Wish. Of course, Cathy!! I remmember this well...you told Linda all about it and we read what you sent us too...This is completely fascinating and an amazing coincidence. Perhaps you could write about it on ABBA and we could do a cross link or something? Love the photo! It keeps amazing me just how much effort gets put into just one book. I really shouldn't keep being surprised, but I keep finding new lengths! You've reminded me that I did do something on it in ABBA, though it was a few years back and I've inherited quite a few more family papers since: http://awfullybigblogadventure.blogspot.co.uk/2008/10/cheyne-reaction-charlie-butler.html. I loved this series when it came out. The central idea is marvellous - and, like all the best ideas, so simple. It consists entirely of books I wish I'd written. Why can't we have History Boys as well?